Two male turkeys (on the left) display for the hens. The eastern wild turkey is one of six recognized subspecies of turkey in the United States, but is the only subspecies found in Illinois. Wild turkeys are large birds. The average adult male (gobbler or tom) stands 3 to 3.5 feet tall and weighs 18 to 24 pounds. Females (hens) are smaller, typically 2.5 to 3 feet tall and weigh 8 to 12 pounds. 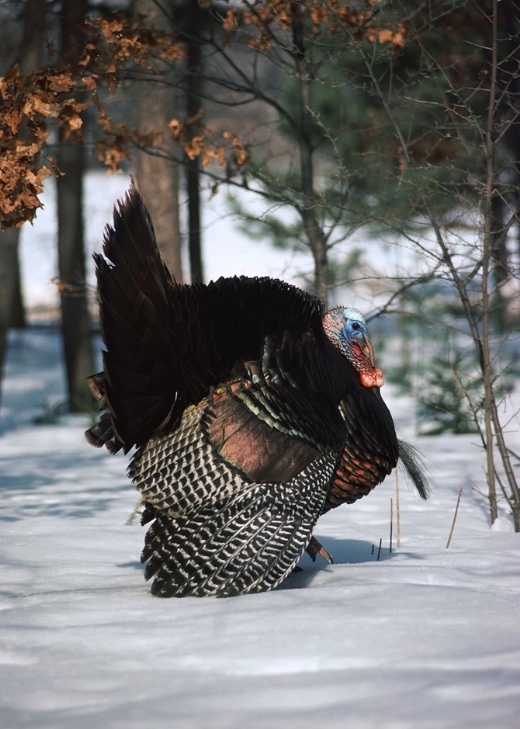 Tom (male) turkey displaying his feathers on a snowy day. Both sexes have dark, iridescent feathers that display shades of bronze, red, purple, blue and green. However, hens have an overall lighter appearance because their breast feathers are tipped with brown, while those of a tom are tipped with black. Besides being larger and darker, toms can generally be distinguished from hens by their leg spurs, beards, wattles (folds of skin below the beak), caruncles (wart-like growths on the neck) and snood (fleshy appendage above the beak). During the spring mating season, the wattles and caruncles of a tom may be bright red, white or blue. While hens have wattles, caruncles and a snood, they are not as large or well developed as those of a tom. Only about 10 percent of hens have beards. Check out the Cornell Lab of Ornithology All About Birds website about the wild turkey for audio clips, ID info and life history. Habitat loss and over hunting eliminated wild turkey from Illinois by 1910, but they were successfully reintroduced. Between 1959 and 1967, the Illinois Department of Natural Resources (IDNR) obtained wild-trapped turkeys from Mississippi, Arkansas and West Virginia. These birds were released in small groups at five locations in southern Illinois. The reintroduced wild turkeys successfully established breeding populations, producing enough offspring that a trap-and-transfer program could be established. Between 1970 and 2000, IDNR biologists relocated over 4,700 turkeys to 99 counties. Today, the wild turkey is a resident in every county in Illinois. The largest populations of this non-migratory bird occur in the southern, western, and northwestern counties. Wild turkeys are very social birds and congregate in flocks during winter. Young turkeys, called poults, often stay with the hen during their first winter. Flock size increases as winter weather becomes more severe, with small flocks merging together in areas with reliable food resources. Turkeys can run greater than 12 miles per hour and attain flying speeds of 50 to 55 miles per hour. They often roost in trees at night. Male turkey displaying his feathers for nearby hens. Wild turkeys are typically wary of people, and usually run or fly away when approached. In urban areas, wild turkeys occasionally become nuisances. Toms can become quite aggressive during the breeding season and may try to intimidate people. Wild turkeys are important seed dispersers and consume many insects. Additionally, poults serve as food resources for predators. Do not let a wild turkey intimidate you. Make a lot of noise, wave your arms and chase the turkey away. Spraying the turkey with a strong steady stream of water from a garden hose can be an effective method to drive the bird off. This technique is used only to scare the turkey away, not to injure the turkey. Wild turkeys that are causing continual problems may need to be removed by professionals. Do not attempt to catch the nuisance turkey yourself. CONTACT an Illinois Department of Natural Resources district wildlife biologist if you need advice on dealing with aggressive turkeys in an urban area. Wild turkeys are not considered to be a public health concern. However, direct contact with wild turkeys or their droppings should be avoided. Wild turkeys use deciduous, mixed, upland and riparian woodlands. Grasslands and woodland-grassland edges are important for nesting and brood rearing. Hen turkey walking in the woods. Adults eat approximately 90 percent plant matter and 10 percent insects, while poults eat a diet comprised mainly of insects. Wild turkeys eat a variety of foods including, but not limited to, acorns, beechnuts, hickory nuts, wild grapes, crabapple, black cherry, several species of berries and grasses, “waste” grain, grasshoppers, crickets and beetles. 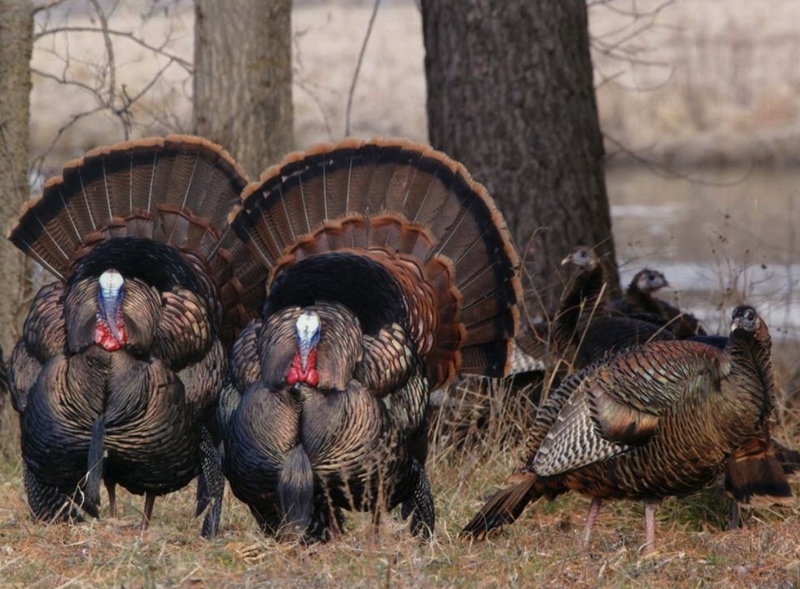 In Illinois, the wild turkey breeding season begins in late March to early April, with the peak of the incubation period occurring in late April to early May. However, nests can be found throughout the summer, as hens that lose clutches to predation, human disturbance or weather events often renest. A turkey hen crossing a road with her poults. Hens build their nests on the ground in shallow depressions that they scratch out in grasses or leaves, often against the base of woody vegetation. Wild turkeys lay an average of 10 to 12 eggs, approximately one egg a day until the hen has a full clutch. Incubation is done by the hen only and lasts for about 28 days. Hens are very sensitive to disturbance while nesting and are likely to abandon their eggs if they are startled from the nest. Young turkeys are called poults and they are cared for only by the hen. Poults are ready to leave the nest within 24 hours of hatching but are unable to fly until they are 10 to 12 days old. During this time period, they are very susceptible to cold, rainy weather and to predators. It is not uncommon for 50 percent or more of poults to die during their first six weeks. Wild turkeys that survive to adulthood may reach 10 years of age, though most do not live that long. 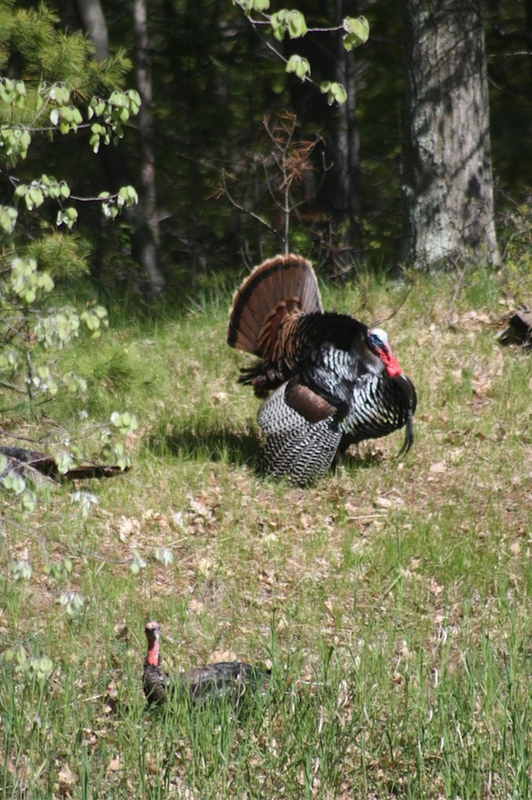 The potential for conflicts between wild turkey and people will increase as the wild turkey population grows and human activity and development increases in turkey habitat. Farmers are often concerned about crop damage caused by wild turkey. While wild turkeys do sometimes damage corn, soybeans and small grains (i.e., winter wheat or oats), researchers in Indiana found that a majority of wildlife-related crop damage is caused by the nocturnal feeding of raccoons, white-tailed deer and small mammals. The researchers found that since turkeys are often visible in the fields during the day, they were blamed for crop damage that they did not cause. Within the past 15 years, wild turkeys have begun to appear more often in suburban settings. Wild turkeys are normally very shy birds, but toms do sometimes exhibit aggressive behavior towards people, particularly during the breeding season. They may also act aggressively towards shiny surfaces such as windows or vehicles, mistaking their own reflection as an “intruder” that needs to be driven away. In some cases, nuisance turkeys are not wild birds, but rather pen-raised turkeys from game farm stock. While it is illegal to release pen-raised turkeys in Illinois, some turkeys have escaped or been released into the wild. These birds often look like wild turkeys, but they lack a wariness of humans, are not adept at living in the wild and often associate people with food. Besides leading to human-turkey conflicts, the escape of pen-raised turkeys have wildlife biologists concerned about the spread of disease to wild flocks and the loss of genetic purity caused by hybridization. Regardless of the origin of turkeys in your area, there are several things that you can do to reduce the potential for conflicts to develop. Do not feed wild turkeys. Providing handouts attracts more birds than would naturally be found at a site. It may also make the turkeys less wary of people, and this can become a problem during the breeding season. If wild turkeys begin frequenting a bird feeder, drive them away before they become regular visitors. Temporarily cover windows or other reflective objects if they have attracted the attention of a misguided tom during breeding season. Orchard and garden plants can be protected using polypropylene bird netting (1⁄2 or 3⁄4 inch mesh) available at many hardware stores, nursery supply centers or feed stores. 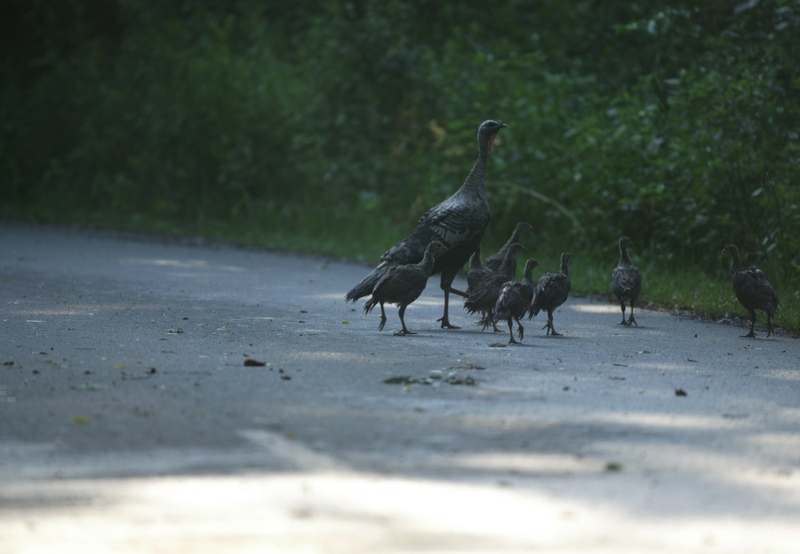 The Illinois Wildlife Code protects wild turkeys. It is illegal to kill or remove wild turkey or to destroy their nests or eggs. If you need assistance with a wild turkey problem in an urban area CONTACT a local Illinois Department of Natural Resources District Wildlife Biologist. Click HERE for more information from USDA-APHIS-Wildlife Services on dealing with damage caused by wild turkeys. In Illinois, wild turkeys are legally protected by the Illinois Wildlife Code. In urban areas, wild turkey may not be removed except by a professional. CONTACT a local IDNR District Wildlife Biologist for more information. In rural areas, hunting can help control populations of turkey. Click HERE for more information about licenses and current wild turkey hunting regulations in Illinois.